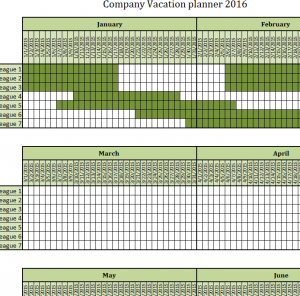 The Company Vacation Planner is just what you need to keep track of your employees and their vacation hours this year. If you’re tired of constantly writing down time sheets whenever one of your employees wants to take time off, this document helps you store that information for all your employees on one page. This is the perfect tool for the holiday season, especially when you have people trading shifts, taking time off, or simply tracking seasonal workers and their hours. Download this free template today to get started. Start in the “January-June 2016” tab if you are still in the first half of the year. Next, in the first column you’ll notice there is a list of “Colleagues”. Simply click on these cells and change them to the actual names of your employees. This will make organization much easier in the future. Each section is broken down by month with a cell representing a day of that month. If one of your employees needs vacation time, you can simply highlight the days they will be out like the example listed in the first two months. If you want to differentiate between sick days, vacation time, or anything else, just highlight the days different colors and create a legend below to help you remember the colors and their meaning. Once you are ready to move to the next set of months, all you need to do is click the next tab over at the bottom of your page. If you want to keep a copy for your files, you can also print the pages by clicking the “File” button in the Home ribbon above and selecting “Print” from the proceeding menu.